This past Labor Day weekend, my beloved cat, Turtle, suddenly lost the use of her hind legs. We rushed her to the veterinary emergency hospital, where she was diagnosed with an arterial thromboembolism. After much kind counsel from Dr. Benjamin and dozens of tissues, we made the difficult and surreal decision to let her go peacefully. You can read more in my tribute to “Turdie Cat” here. As you can probably imagine, this rocked our world. Turtle was always healthy, happy, and friendly as could be. We took her for regular checkups, and she was due for her annual visit at the end of September. We knew that she had a mild cardiac disease that we needed to “keep an eye on,” but we had no reason to suspect that it had progressed to the point that her life was at risk. I knew that both my girls were getting up there in age, but it wasn’t until we were driving to the ER vet that I did the actual math. We adopted them seven years ago when they were both approximately 7 years old, so both Olivia and Turtle were likely 14 years old, if not older! When cats are young, it’s easy to take their health, happiness, and abilities for granted. But, as they get older, it’s so important to be proactive about both their health and their environment. 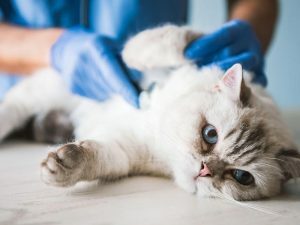 So, for those of you with kitties age 7 or above, I decided to write a post to help you prepare them for the healthiest, happiest aging experience possible. This will help you, too, because you’ll know that you’re doing everything you can to help them live comfortably as they get older. 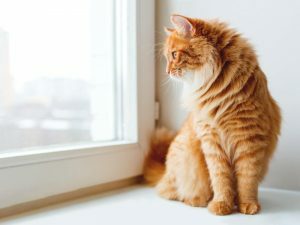 Although yearly checkups are fine for younger or middle-aged cats, vets recommend that senior cats be seen twice a year. Cats age faster than people do. After their first two years (when they mature to be about 25 in human years) every year is approximately the equivalent of 4 to 5 human years. When you think about that, it’s easy to see how a cat’s health could change dramatically in a year’s time. And since cats are masters at hiding the signs of pain and illness, you may not notice anything at first. More frequent vet visits will help you catch the early signs of problems like kidney, liver, or heart disease. Blood work and other tests can reveal health issues that kitty has kept hidden! Consult with your vet at least every year to make sure your kitty is eating the right formula for her nutritional needs. Certain health conditions may require special diets. 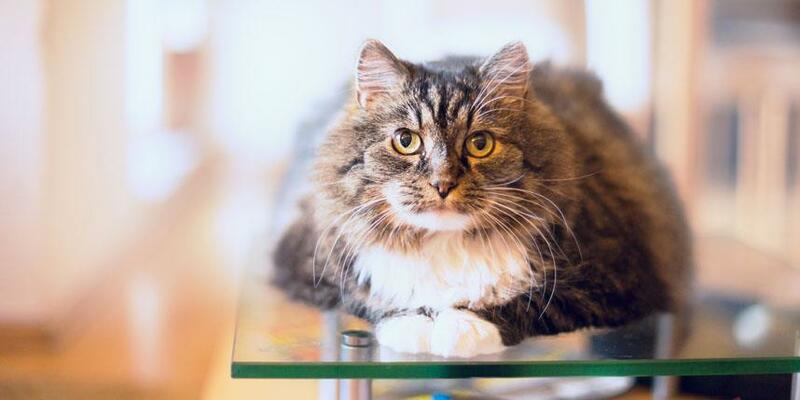 Some veterinarians may recommend supplements to help kitty feel younger for longer. Being overweight or obese can contribute to health problems. 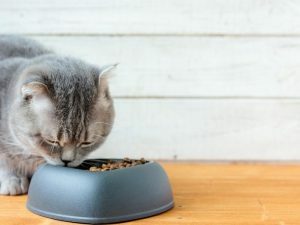 You can help your kitty stay at a healthy weight by consulting with your veterinarian about how much she should be eating. If she’s put on a few extra pounds, your vet can help you change her diet to help her reach and maintain her ideal weight. It’s important to follow your vet’s recommendations for weight loss, since losing weight too quickly can lead to potentially fatal liver disease. 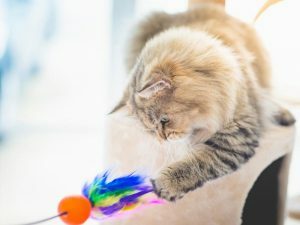 Young cats usually play more often than older cats, but that doesn’t mean older kitties don’t need to get their groove on! In addition to helping with kitty’s weight, exercise can also keep her mind stimulated and engaged. 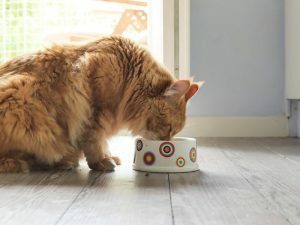 It may take a little more coaxing to keep your senior cat active, but she’ll probably get moving for daily playtime with her human family and fun interactive toys. Some cats even enjoy being taken for walks, especially if that is something they’ve been doing since they were young. 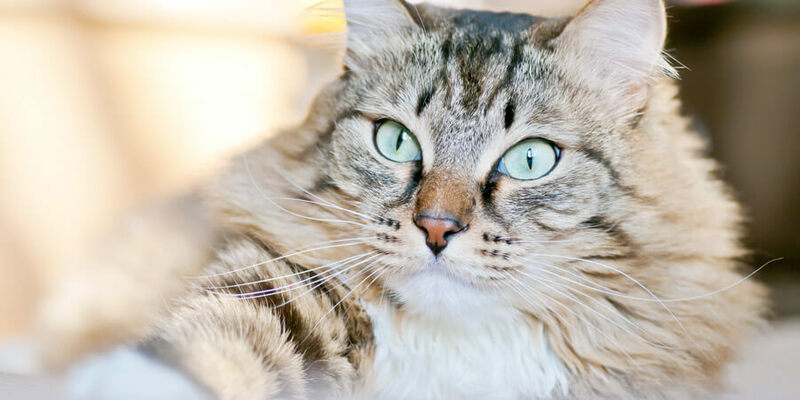 Keeping your kitty’s mind active can help to slow the effects of aging. A challenged, engaged brain is a healthy one! Interactive feeders are a great way to give her a mental workout. A window perch is another opportunity for mental stimulation. Although it may not look like she’s doing much, her mind is working like crazy while she’s taking in the entertaining sights from the great outdoors. And, of course, regular playtime with fun, engaging toys will keep her mentally and physically fit. Dental issues can cause discomfort and may contribute to unwanted weight loss if kitty avoids eating because it’s too painful. But in addition to that, bacteria from periodontal disease can contribute to illness and even affect her organs! 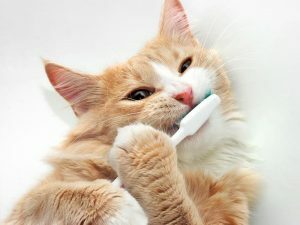 If brushing kitty’s teeth isn’t an option, dental treats can help keep her mouth clean. Check with your veterinarian for recommendations on dental cleanings to keep kitty’s teeth and gums healthy. 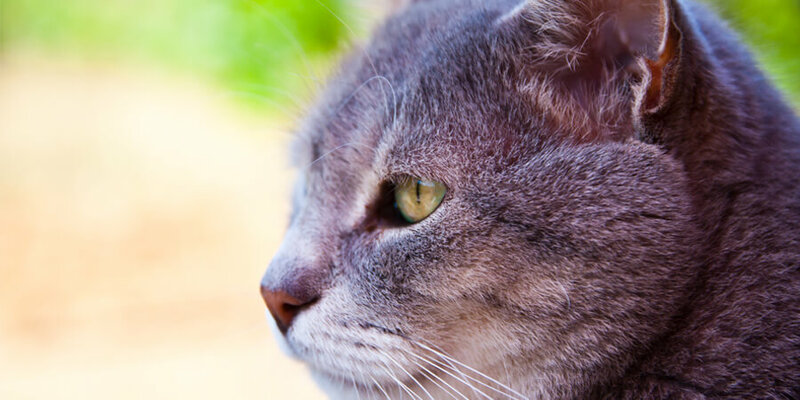 Up to 90% of cats over 12 have some form of arthritis, and many develop it much sooner than that. If your cat starts to experience joint pain, make sure that her food and water dishes are easily accessible. If you’ve always kept them up high, you may need to move them to a location where she can reach them without jumping. 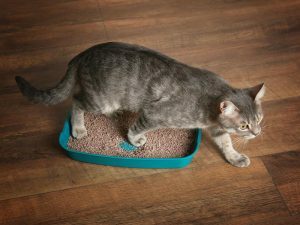 Switching to a litter box with lower sides can help her to climb in and out more easily. 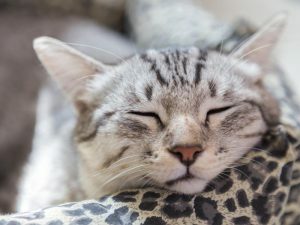 If your cat’s favorite perch is too high for her or if she’s used to sleeping in your bed, steps can help her to reach those spots if jumping becomes too difficult. Cats of any age appreciate a nice cozy spot to curl up for a cat nap, but as they age, those creature comforts become even more important. A nice soft bed is just what kitty needs to rest those sore joints and muscles. It’s even better if it’s in a warm, sunny spot where she can soak in some heat, too! And it goes without saying that lots of love will go a long way towards helping kitty to age with grace. The golden years with our feline family members are a special time – enjoy it! Many of them become a little more mellow with age, making it easy to enjoy just being together. Snuggle with them, rub their chins, listen to them purr, and know that they love every minute (and so do you!). Olivia is now an only cat, so she’ll get double the attention and love. But we’ll miss our sweet Turtle every single day. 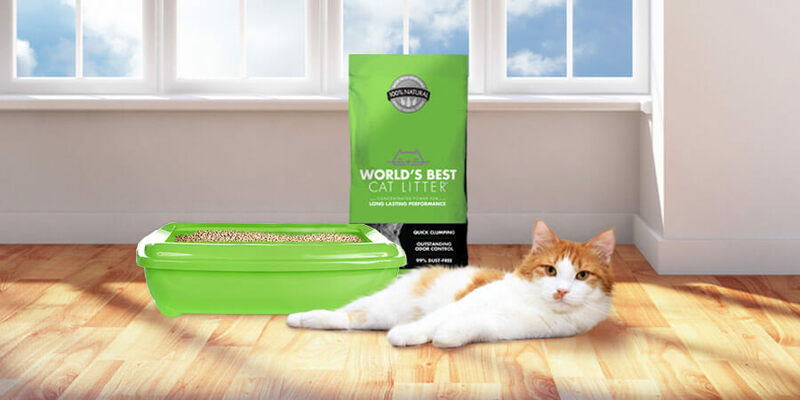 I hope this post will serve as her legacy to help your beloved felines live better as they age. For more ways to live healthier and happier with your cat, visit my website at www.kristenlevine.com.